Almost four years ago, I made the decision of a lifetime. I decided that I would teach my son Chinese. Little did I know, that decision would completely restructure my life. I researched hours every night when he was a toddler for the best books, language apps, tutors, and even language studies I could find to put together a customized Chinese curriculum for him. I was so concerned that he would get frustrated with Chinese and begin to resist going to language classes or hearing it spoken. But, quite the opposite happened! My son’s favorite evening activity is to watch stories on YouTube. One night, I overheard a language I didn’t think my son was familiar with. It was Arabic. He sat for almost 30 minutes, mesmerized as two little kids acted out Three Little Pigs, speaking nothing but Arabic. Days later he even begged to watch it again and other songs and fingerplays in Arabic. So, in 2015, we added Arabic to our language learning journey. Many of the same resources and strategies we have used with Chinese have been equally successful with Arabic. Raising a bilingual (or multilingual) child is challenging enough, but finding affordable and fun ways to keep each language engaging can be difficult. I’ve tried a lot of strategies and games over the past year but found that these three have worked wonders to teach my son Arabic. Record it and play it back often. When we added Arabic to the language learning mix, my son was very excited to have a new tutor and a host of new books to read. Since Arabic and Chinese are so different, I was a bit concerned that he would mix up the tones, get the words confused, or just become “burnt out.” Randomly one day, I made up a game, and now we play at least once a week. I simply recorded his tutor saying a few common greetings on my phone. They were words she had introduced him to and wanted him to practice in between lessons. So, as a family, we play the recordings back and take turns guessing what she is saying in Arabic. Over time, we have added more sound bites to the game and are up to over two dozen short phrases that my son can hear and instantly recognize. Write on the walls. I had to get creative with helping my son differentiate between English, Chinese, and Arabic. 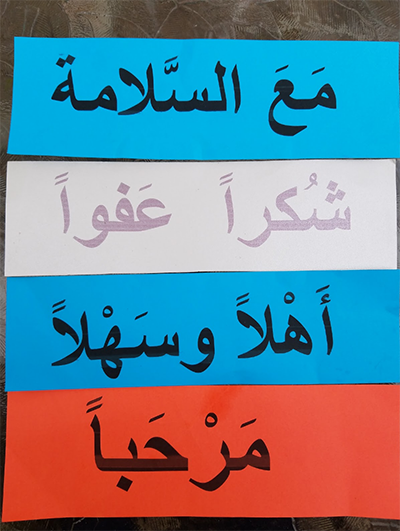 I purchased a pack of TeachStixs and used these to help him trace and draw the Arabic words he would learn with his tutor. TeachStixs are designed to teach the English sight words, but they also come with a bundle of blank, reusable, sticky fabric flashcards that you can put on the walls or on objects in your home. 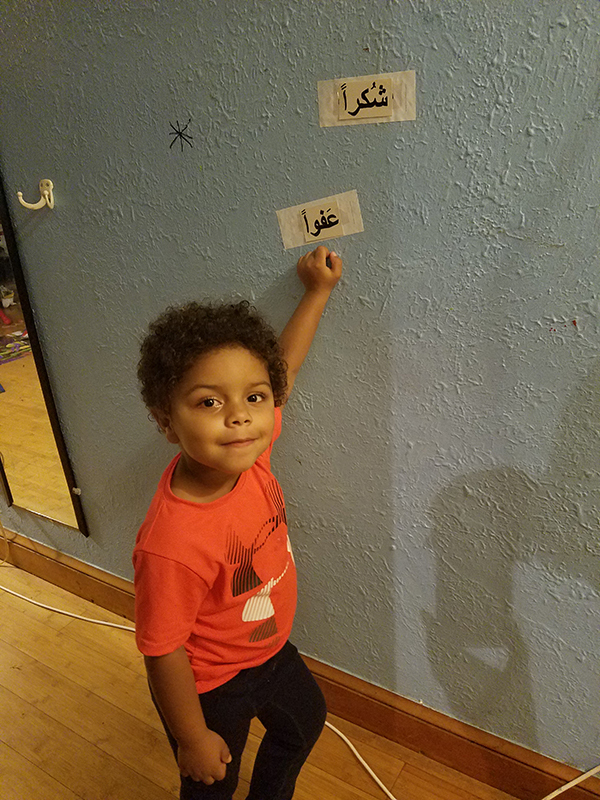 Every week, after my son’s Arabic lessons, he and his tutor find a new place to put his new word and they trace it on the fabric together. We started out only putting the word next to the object it corresponded with. But, now he is comfortable with recognizing the word and its equivalent English meaning that we move them around each week and challenge him to find the word when he hears it. Appeal to their desire to win. Kids, this age, love to win or be first and my budding linguist has quite a bit of a competitive side. Every morning on our 20-minute car ride to his Chinese immersion school, we play an Arabic language game. At first, I challenged him to get through his flashcards before my 5-minute timer on my phone went off. Then when he mastered that goal, so we upped the ante a bit and reduced the time. When he was able to recite the words on each flashcard in Arabic, I added on the meaning in English, and then its equivalent in Chinese. After about three weeks of this, he could zip through a stack of 50+ homemade flashcards, in all three languages, well before we even hit the highway. 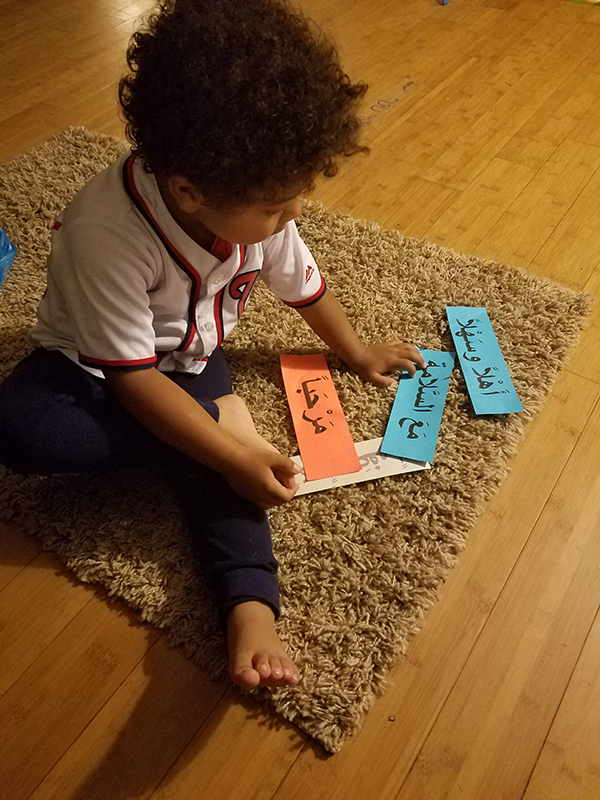 The more my son’s Arabic skills expand, the more we may need to tap into other strategies and resources to keep the fun and learning going. 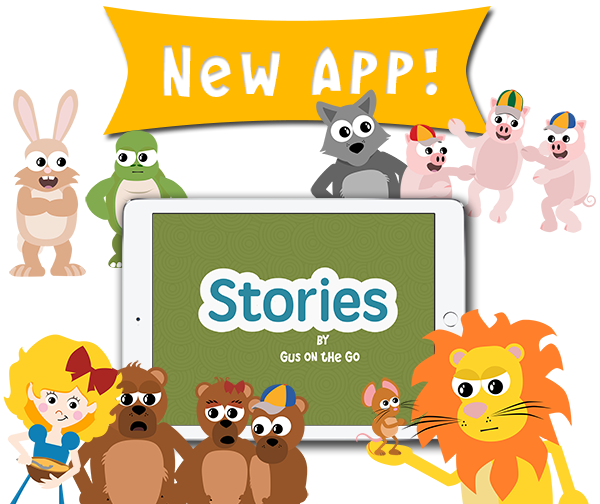 We have also explored language learning apps and have found them to be quite helpful since they provide my son with both structured play opportunities and exposure to Arabic. 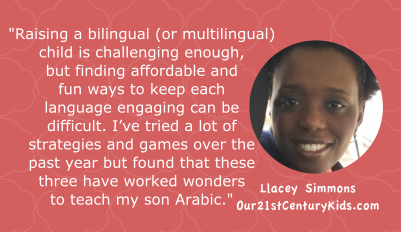 Plus, language learning apps have been an effective and affordable way for me to measure my son’s progress with Arabic and find out new words to add to our growing list. Llacey Simmons is an educator by heart and by trade. As an academic tutor, and now, mom to a preschooler, she spends her days helping students master complex Math and Science topics and her nights researching the latest tools to help her some conquer the Chinese and Arabic languages. She runs the informative blog, Our 21st Century Kids to give other monolingual parents the information and strategies they need to raise bilingual children.